No green in sight, outdoors. I love to see houseplants flower, but just plain living foliage  some chlorophyll keeping the faith  is food for my soul too. However, come spring I go back outdoors; so my houseplants must thrive on neglect. Here's one: a Variegated Peperomia  but watch out, more than one variety of Peperomia has this for its common name. The tough one is P. obtusifolia a.k.a. Oval-leaf Peperomia. 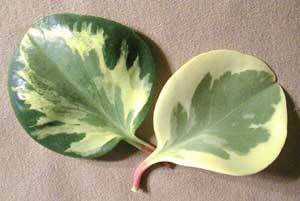 I have two different plants, with two different variegation patterns on their leathery, three- to five-inch leaves: one has mid-green centers and a wide, ragged creamy-yellow edge; the other has the same slightly grayed-green centers, with a dark green edge, and between those two a creamy-white zone stippled and jagged with fantastic patterns of variegation. I've even heard of a variety with pink edges. The fat burgundy stems of this plant grow straight up for a while, and then flop over and sprawl, sending out new shoots that go straight up... etc. It wants part shade, and well-drained soil. Let it go bone-dry between waterings; the only way to kill it is to overwater. When it gets as big as you want it, stop fertilizing. The past three years my Clivia grew only handsome, sturdy, dark-green strap-like leaves. It made a strong accent for some of the busier foliage in my windows, so I was happy with the effect. But this winter it also bloomed: a spray of fourteen two-inch trumpets, orange with a yellow throat and base, and long yellow stamens punctuating the arrangement. The flowers started to open when the flower stem was still so short that the blooms were wedged deep in the crown where the leaves converge; eventually the scape grew taller and the flowers spread apart, transforming an almost-hidden treasure into a showy display: what drama! This plant too needs only a small amount of sun, water, and fertilizer. I'm crazy about ferns, but they're finicky  except for the Dallas Fern. This is a smaller version of the old-fashioned Boston Fern, with little sword-shaped leaflets marching rhythmically down the leaf's arching central stem. It can't stand direct sun or hot air from a heater, and it likes to be fed monthly  but I don't mist it, sometimes it goes dry, sometimes I overwater it and it stands in water  and it just keeps going. Like the Oval-leaf Peperomia and the Clivia, it's tough. In fact, I think you could grow these three in an office! For more information on Peperomias, see the Central Florida Research and Education Center's Peperomia Production Guide, where I learned that my two plants may be P. obtusifolia 'Marble' and P. obtusifolia 'Variegata'. And here's a good picture of a small plant at Plant Ranch.